I love to read. It's one of my favorite ways to spend an afternoon....when I have time to do so. A good book, a cup of tea, a roaring fire, a pup on my lap. Perfect winter's afternoon. But now spring is on the horizon and those afternoons of reading by the fire shall give way to working in the garden....and dreaming about the garden. I have a stack of gardening magazines and catalogs ready to go for whenever a spare hour comes my way. 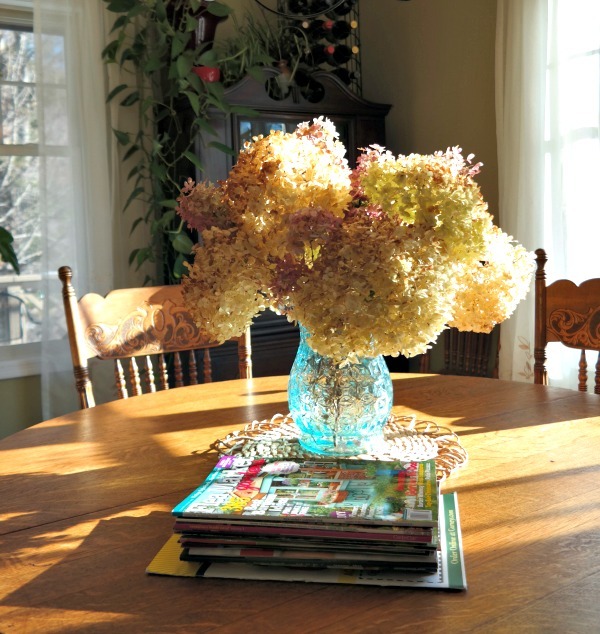 Do you love to look at gardening magazines to get inspiration for your spring plantings? Or do you have a tried and true spring routine that you follow every year? I'm still learning my way around this property since I'm here less than a year at this point. This will be the first gardening season that I will be making significant changes as I had to wait out a season to see what the previous owners had planted. And what I wanted to change. I told you about the Dogwood that never blooms....that's a goner this year. I will pot it up and send it home to live with Mom and Dad down in the valley. It will be happier there. And there are the roses that I'm trying to nurse along and encourage to bloom....the obelisks have arrived and one of these days I'll get around to tying up the roses and taking some photos to show you. There's another rose bush in the garden bed next to the veggie garden - it didn't do much last year and needs a little boost as well. I think it produced one rose last year....if it does that poorly again this year it may need to find a new home. I haven't opened even one of these magazines yet, not even for a tiny peek. I'm saving them for a day when I can dedicate some serious dream time to perusing every single article and photo. Do you know how hard it is to have these 4 awesome magazines and not even open the cover for the tiniest look inside? Pure torture, I tell you! I was drooling over the magazine when I saw it on Brenda's newsletter and then last night, lo and behold, there it was in my teeny tiny mountain top market! Who knew? I can't wait to sit down and enjoy every page! 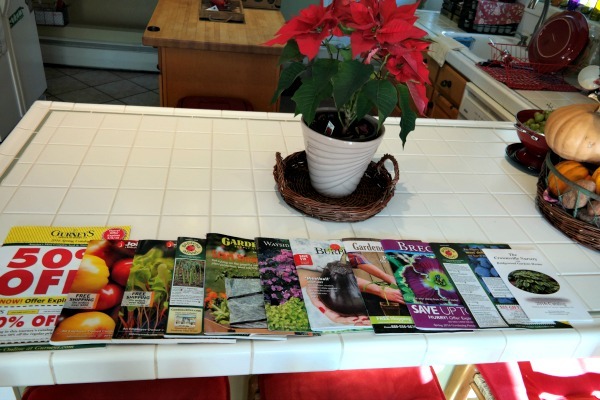 Look at all these gardening catalogs waiting for my attention as well - crazy! And this is only the select few I kept - many more went straight into the recycling bin. I'm going to have to quit my job in order to have time for all these! These four are my favorites, though. 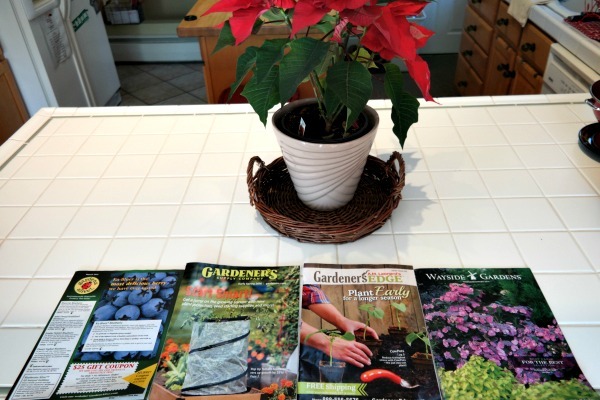 I order from Gardens Alive, Gardener's Supply, and Wayside Gardens every single year. The other one....Gardener's Edge....is brand new to me this year but there were some great items in there. I'm going to order a couple of things for sure. Meanwhile, I'm still reading the Rosemont Series by Barbara Hinske - this is the second novel in the series - I finished the first one in the wee hours the night before last. I'm loving this series so far - thank you, Marty from A Stroll Through Life for telling me about these books! It's almost time to break out my all time favorite Spring read.....I can't start it too early or I'll go crazy waiting to get my hands in the dirt. Perhaps when I finish the Rosemont series it will be time. What's on your reading list for Spring? Well I've been missing some of your posts and didn't realize it till now. Sorry about that! I am a magazine lover/hoarder too. Decorating and gardening magazines are my favorite. No worries, Stacey, I've been missing posts all over the place as well...it's hard to keep up sometimes, we do the best we can! I've been busy ordering flower seeds and bulbs but it's been so windy at the farm that you can't get out and plant. I love your dried hydrangeas and your house is so lovely and always in order. Mine will be under construction probably through May and then I can make it pretty too. Right now...I'm enjoying yours. What zone are you in Valerie? I do try to keep my home in order - it's my haven, after all, at the end of a long day. It would help if I could keep my kids (and their messes) downstairs!! ha ha ha ha I need to put up a rolling gate like they have on the stores in the city! I am totally with you on enjoying having a pile of new magazines waiting for me to read. I have a few stacked up on my coffee table right now that I will take with me on our next trip to the mountains. As for gardening, I am hoping that following along as you plant your garden this year will inspire me to start my own next year. I don't have a green thumb at all, unfortunately. 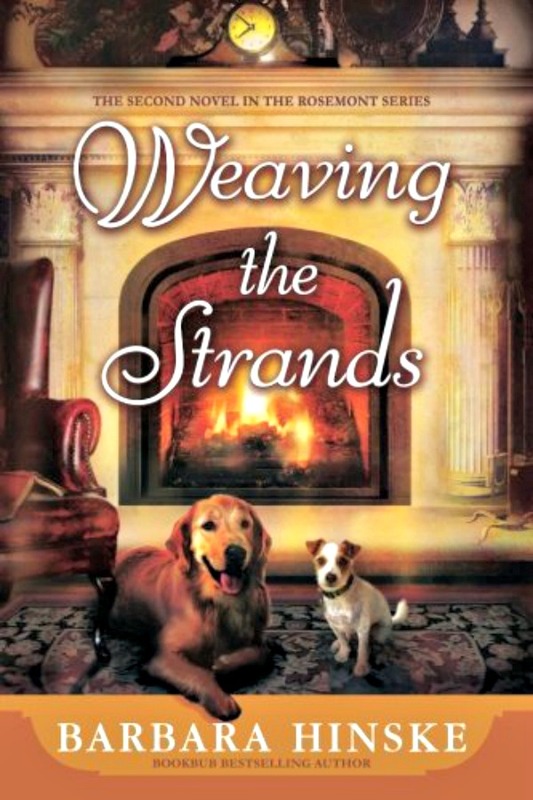 I am currently reading and enjoying "Lady in Waiting" by Susan Meissner. Have you read any of her books? I am adding the Rosemont series to my list. Do you know when I get most of my magazines read, Courtney? On the trip down to NJ when we go to visit my sweetie's parents! I always bring a tote full of magazines and when we get off the side roads and onto the thruway....out come the magazines! I can't believe how similar are our reading tastes. 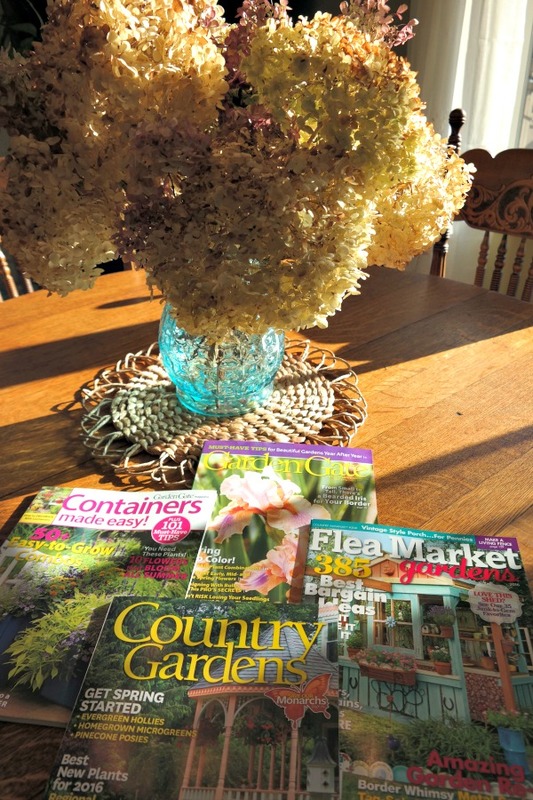 I have almost as many garden magazines as you do, and I only container garden! I'm also a Barbara Hinske fan, along with almost every author of cozy mysteries that I can find. I've been reading advanced digital copies from NetGalley lately and have recently completed A Clue in the Stew by Connie Archer, Fogged Inn by Barbara Ross, and am currently reading Death of a Bacon Heiress by Lee Hollis. I've enjoyed them all! Thanks for all those suggestions, Pattie - I'll have to check them out! I love, love, love looking through gardening magazines and seed catalogs. What I don't actually love is gardening! Well, that's not really fair, my allergies don't love it when I garden. We have opted for perennials because of that...but it's still fun to look! Enjoy your reading, I know your garden will be fabulous! The older I get the less my allergies like gardening either, Kim - last season I survived on Allegra! I typically hold back on looking at a magazine, to keep it as a sort of treat, like you I guess. I've been reading a lot at night. I like thrillers. I think one day you'll be blogging full time and won't have to work outside your gorgeous home. Thanks for the shout out! Ha - you and I think so much alike! That's exactly how I feel - my magazines are a treat for me when I truly have time to sit and enjoy them! Every year I have such big plans for my middle garden that goes out into the lawn. When it comes time to pull stuff I just don't have the heart to do it. There is so much in there I am afraid I will pull the wrong thing! I need to look at some gardening magazines for ideas and courage! Thanks for the inspiration! Since my property has such wild edges I can put anything I rip out of the middle into the wild gardens and just let them go - it makes it much easier to rip out stuff when I know it's not getting tossed! It was the beautiful gardening magazines that kept me going back before I retired. I looked and dreamed and planned...and spent every weekend doing a little something in the yard. I finally got rid of all those magazines from the early 1990's. When I moved into this house it was so hard for me to get rid of my gardening magazines....I actually brought them into work in a bag and since nobody ever took them they are still in my office! Oops....they might end up back at home again! Every morning I say I'm going to take a little time and just read one before work....but there are too many other things that need my attention and I don't want to rush through them! I agree with Karen ~ you have amazing will power not to open at least 1 magazine! :) I will be anxious to see what you plant and the results as they grow. I live in an apt and have a small balcony so I do a few pots of flowers. This year I've decided to use those containers that "hang" over the balcony railing so I can have cascading flowers. Wish me luck! I get so excited in the spring and then by June everything's burning up due to our brutal summers. Thanks so much! Those terrace gardens are magnificent! I love magazines and gardening, too, but believe it or not, I don't read gardening magazines! I'm one of those gardening people who justs "wings it". Or, I ask questions in person at the fabulous, gigantic nursery that I frequent. We've lived in our house almost 26 years so our gardens are pretty much all established now. Except for the north side of our house...we had some bushes planted there and they've all died. We need to re-figure that area. Could you take a magazine to work with you and read it on your lunch break? That's what I did when I was working outside the home. It was a lovely pleasure from boring office work! I'm not familiar with that book - you know I'm going to have to look it up now, don't you? Thanks for the suggestion!! I am the same way. I love to read a good book and sit in my comfy chair in the winter, but come Spring I am out in the garden working. I cannot wait to go out there and start pruning my shrubs and preparing our raised veggie bed for another year. It's very cold here today otherwise I'd be out there doing the same thing! My thought here is that not too long ago you also spent a lot of time showing books that you would like to read. Well, lucky for me, I have the weekend off - that's two in a row, yippee! So I will get some time to catch up on my reading! That exciting wait to open a glossy new magazine as a treat, I love it! I do this in early December when I find a stack of British Christmas issues, the stage set with a couple of hours with hopefully no interruptions, a notepad for notes as I glory in each page. This spring our garden is being turned over to a beautiful young woman in her 20s who has so many plans for its future. As much as I'll miss our house and gardens, I can let go of it knowing that she and our son will care for it for decades to come. I will still have time when we move to plant pots of herbs in our new home and maybe a tomato plant or two! And I'll look forward to seeing how your garden grows, Mountain Mama! Oh, Dewena, what a lovely legacy to pass along to your son and his wife!! I look forward to seeing your new home...and good luck with your move!